M Walid, J Menard, M Ajjan, J Robinson. A Variation Of Type III Odontoid Fracture Presenting As Isolated Jaw Pain. The Internet Journal of Orthopedic Surgery. 2006 Volume 7 Number 1.
and neck were negative. MRI showed C3-C4 nucleus pulposus hernia. CT of the cervical spine revealed an acute fracture of C2 which extended through the base of the odontoid into the right side of the C2 body, right pedicale and right transverse foramen. The patient was immobilized with a halo and the pain substantially improved. Isolated jaw pain can be sign of odontoid fracture. CT of the cervical spine is indispensable to exclude occult fractures not seen on plain X-rays. The incidence of acute cervical spine (C-spine) injury due to blunt trauma in adult patients admitted to emergency centers ranges from 1.9 to 3.8 %1. More than 60% of spinal injuries affect the C-spine, and approximately one out of five cases of all C-spine injuries involve the axis2,3. As many as 10% of unconscious patients who present to the emergency department following motor vehicle accidents (MVAs) have C-spine injury4. MVAs and falls are responsible for the majority of the Axis (C2) fractures. C-spine injuries are the most feared of all spinal injuries because of the potential for significant deleterious sequelae. Correlation is noted between the level of injury and morbidity/mortality (ie, the higher the level of the C-spine injury the higher the morbidity and mortality). Craniocervical junction injuries are the deadliest. Clinical manifestations range from minimal upper extremity motor and sensory deficits to quadriplegia with respiratory center involvement. 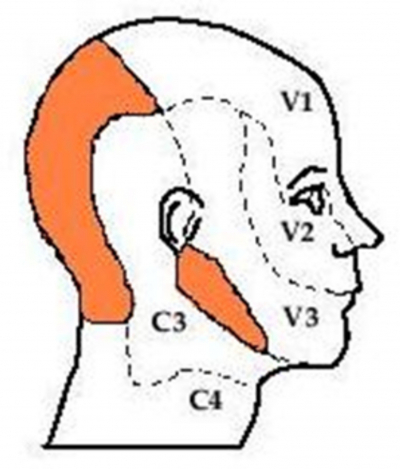 The unique features of C2 anatomy and its articulations make assessment of its injury challenging. The atlantoaxial (C1/C2) articulation is made up of 3 joints - the central atlantoaxial joint and the paired lateral atlantoaxial joints. Odontoid fractures were first described, by Lambotte, more than a century ago (1894). Throughout the literature, attention has always been drawn to the fact that many of these fractures are detected late after the traumatic event, and that odontoid fractures are notoriously prone to non-union. The earliest classification was that of De Morgues and Fischer (1972), which distinguished between fractures of the base and fractures of the neck of the odontoid process. Type I (5 %): Apical (tip) fracture. Type II (60 %): Body fracture, which passes above a horizontal line drawn through the upper border of the superior articular facets of the axis. It corresponds to the odontoid neck fracture in the De Morgues and Fischer scheme. These fractures are very prone to non-union unless sufficient stabilization of the fracture site can be provided. Type III (30 %): Basilar fracture, with a fracture line passing into the body of the axis. Another type of odontoid process fracture is a vertical fracture through the odontoid process and body of the axis (less than 5% of cases). This type of fracture is often considered a variant of traumatic spondylolisthesis of C2. An 83-year-old man presented to the emergency room with severe right jaw pain. The patient stated he tripped in the frontyard of his house 2 days before. He denied any extremity pain, abnormal sensation or weakness. He denied any change in bowel or bladder functions. Past medical history was remarkable for coronary artery disease, myocardial infarction, coronary artery bypass grafting, carotid endarterectomy, chronic heart failure and diabetes mellitus. On physical examination he was alert and fully oriented. There was nothing remarkable on neurological examination. Two frontal X-ray images of the head and C-spine revealed no gross fracture or obvious temporomandibular joint dislocation (Figure 1). The patient was unable to cooperate for more definitive imaging of the mandible. Figure 1: X-ray images of the cervical spine. : Frontal image of the mandible: No gross fracture or obvious temporomanibular joint dislocation. Surgical clips are projected over the left neck from a previous carotid endarterectomy. : Open mouth image of the head and neck: No evident fracture of the odontoid process. Surgical clips are projected over the left neck from a previous carotid endarterectomy. 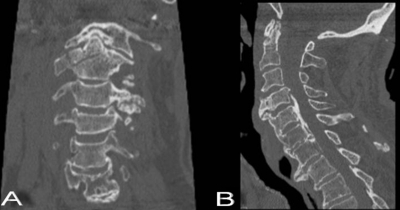 Posterior osteophytes and severe multilevel spondylosis with ossification of the posterior longitudinal ligament that combined to cause spinal stenosis at C4-C7 (degenerative changes). Figure 2: CT tomography of the cervical spine. : Frontal view: 1. an acute fracture of C2 which extension through the base of the odontoid into the right side of the C2 body, right pedicale and right transverse foramen. 2. bilateral facet hypertrophy at C3-C4 that caused bilateral neural foraminal stenosis. : Anteroposterior view: Posterior osteophytes and severe multilevel spondylosis with ossification of the posterior longitudinal ligament at C4-C7 that combined to cause spinal stenosis. The patient was immobilized using a halo and the pain immediately and substantially improved. Significant force is required to produce an odontoid fracture in a young individual, which usually happens due to MVA, fall from a height, skiing accident, football injury, wrestling … etc. In patients over 70 years of age, simple falls may cause the fracture6, as happened with our patient. The many articulations between the cervical vertebrae make possible the extensive range of motion in the cervical spine. In a young person, cervical flexion and extension is about 100°. Bilateral rotation is about 80° with approximately 50% of this range occurring between C1 and C2. The range of lateral bending is about 30-50°. Old people usually have decreased cervical mobility and reduced ranges of motion8. That is why in an old individual with fragile bones (osteoporosis) and decreased range of motion (spondylosis) mild trauma may cause C-spine fracture with mild neurological injury. Common symptoms of odontoid fracture are high posterior cervical pain, sometimes radiating in the distribution of the greater occipital nerve (occipital neuralgia) with paraspinal muscle spasm, reduced range of motion of the neck and tenderness to palpation over the upper C-spine. Type III odontoid fractures are rarely associated with neurologic injury6, this is why our patient waited two days before coming to the hospital, and they can be easily missed on initial evaluation6 as happened with the negative frontal X-rays of the mandible (skull and C-spine) in our case. The unusual element in this story was the patient's presentation with right jaw pain only. A study of a large cohort of individuals involved in traffic accidents showed that patients with whiplash-associated disorders may demonstrate symptoms well beyond the neck, including jaw pain7. This could be explained knowing that the skin of the jaw is partially covered by the dermatome of the C2 root, which in our case could have been encroached upon by the additional extension of the odontoid fracture to the right pedicle and transverse foramen (Figure 3). The immediate improvement of jaw pain after halo immobilization confirmed this assumption. articulations, cervical interspinous ligaments and the trapezium. Careful evaluation of these structures should be performed by a physician skilled in diagnosis and treatment of such injuries (an orthopedic surgeon or a neurosurgeon). Adequate radiological imaging must be performed to elucidate elusive injuries of the odontoid process. The standard 3-view C-spine series has traditionally been used for the radiological screening for evidence of C-spine injuries. It consists of anteroposterior, lateral and open-mouth odontoid views. The odontoid view is difficult to obtain in young children because of ossification centers and synchondroses that increase the complexity of X-ray diagnosis. Only anteroposterior and lateral views are now recommended for the radiological evaluation of children ≤8 years of age9. The odontoid view is still recommended for older children. The false-negative rate for a single cross-table lateral radiograph ranges from 21 to 26%; therefore, CT scanning with attention to the suspected level of injury is indispensable to exclude occult fractures and to evaluate regions not seen adequately on plain X-rays10. The role of CT scanning with multiplanar reformatting is crucial. It delineates bone details of the cervical spine and demonstrates fractures and the extent of bone injury far better than does MRI. On the other hand, MRI is helpful in the evaluation of trauma-related spinal cord injury. It also facilitates the evaluation of extradural spaces and the integrity of the spinal ligaments. Increased intraspinous distance, divergence of the articular processes and widening of the posterior aspect of the disc space are signs indicative of cervical spine instability. Radiological studies often diagnose incidental findings that do not contribute to the origin of the patient's pain. A significant percentage of the population (over 60% in some studies) demonstrate degenerative disc disease, herniated cervical discs or cervical spondylosis and remain asymptomatic. A careful physical and radiological examination with clinical correlation is paramount to the correct diagnosis and treatment of referred pain problems and can help spare the patient the deleterious consequences of a missed C-spine injury. Odontoid fractures are extreme in their clinical manifestation. They can be fatal or demonstrate no significant neurologic deficit . 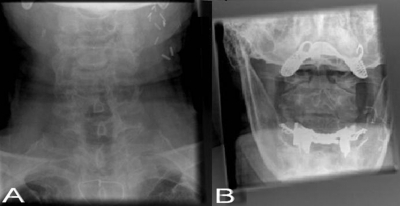 A variation of type III odontoid fracture with extension to the pedicle and transverse foramen may present with isolated one-sided jaw pain depending on the direction of fracture extension (to the left or to the right). Plain frontal X-rays of the head and neck may be false-negative and CT is always necessary to make a diagnosis.